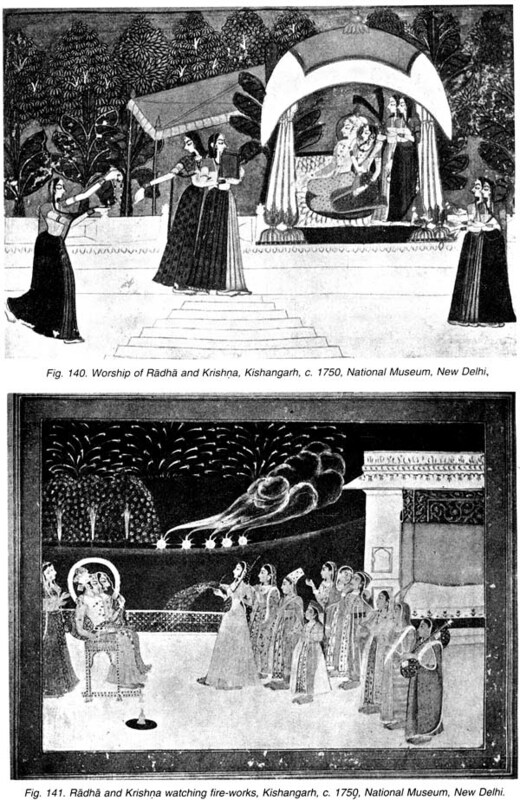 The main aim of this volume is to present the life of Krishna as delineated in Indian art. The life of Krishna and his teachings have had a profound influence on the minds of the Indian people and as such the theme was popular not only with the saints and the poets, but also with the artists. 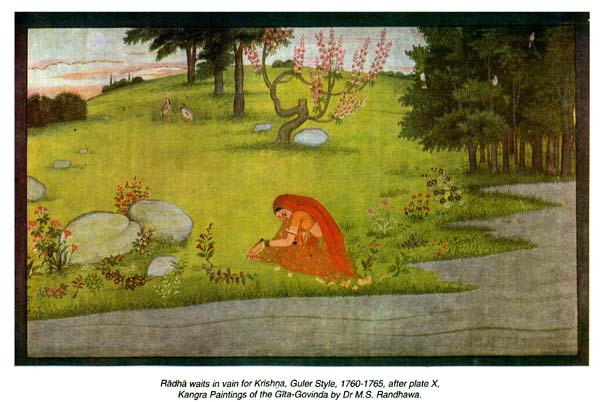 Krishnaism pervades the whole Indian life, its religion, philosophy and art. The material for the study of the subject is enormous and diffused all over India in a varying degree. 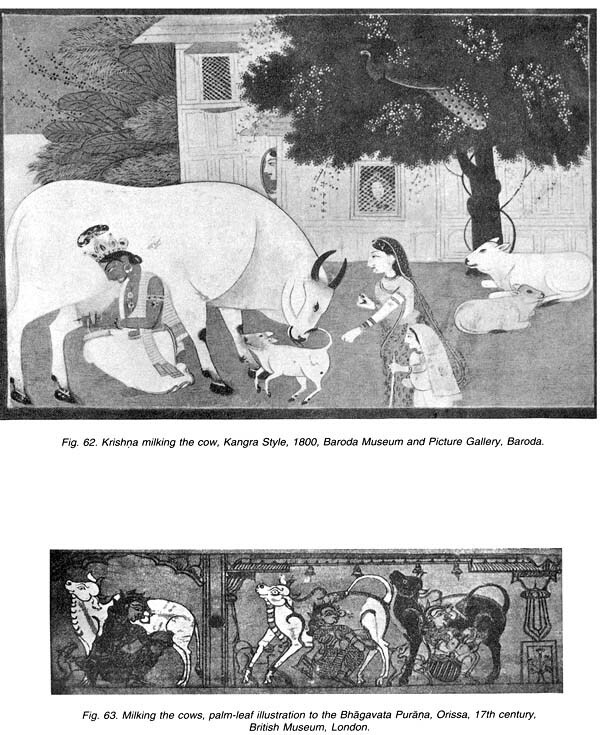 This volume includes most of the best examples of Indian art to represent the episodes of his life. This volume is broadly divided into two parts, i.e. the text and illustrations. 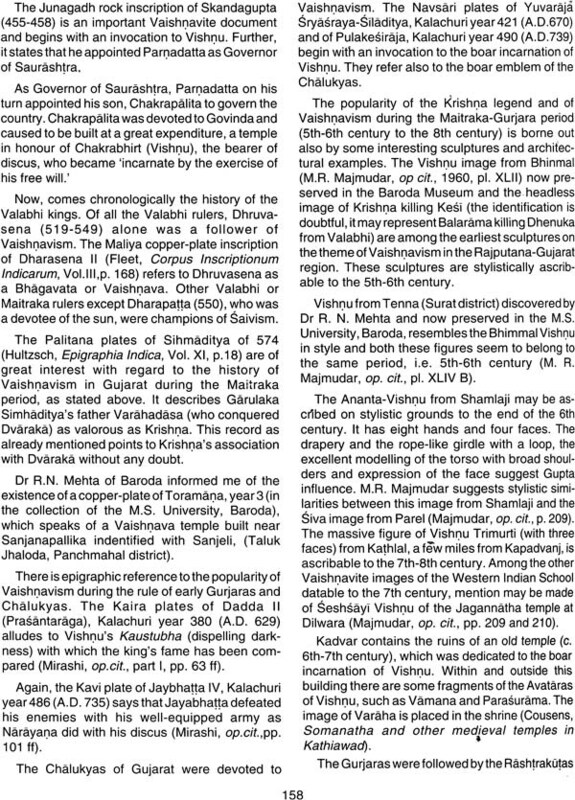 The text portion describes Krishna's life as portrayed in the Puranas, the Harivamsa and the Mahabharata, and discusses the antiquity and absorption into the broad framework of Vaishnavism. It may be mentioned here that Krishna is a composite character, and many religious ideas and thoughts have contributed to the development of the Krishna legend. 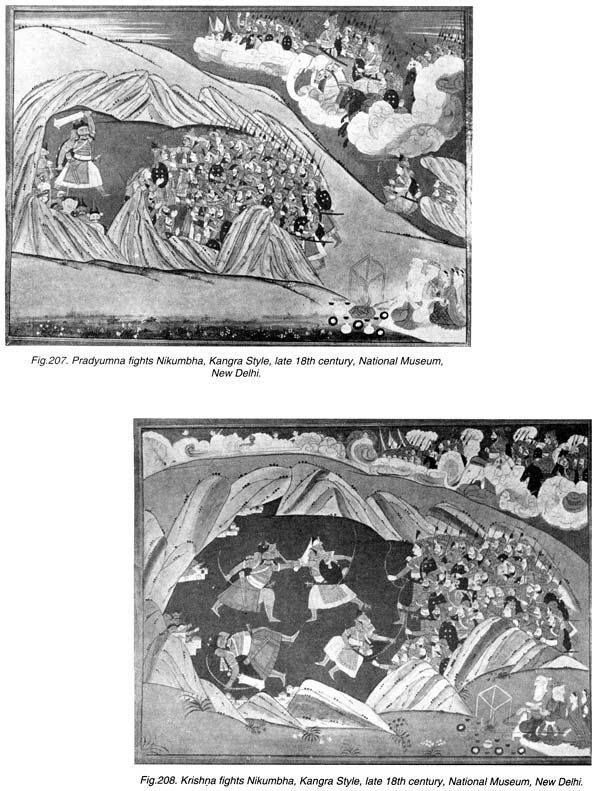 Centuries have run into millennia in India in the tradition of the narration of cradle tales from the two great epics, that have provided not only a deep and abiding ideal education, rooted in ethical principles, far transcending the glamour of mere literacy, but also moulded the character of the people in consonance with the highest thought in didactic literature of rare quality, gathered mainly through the ear, in the established mode of sruta. 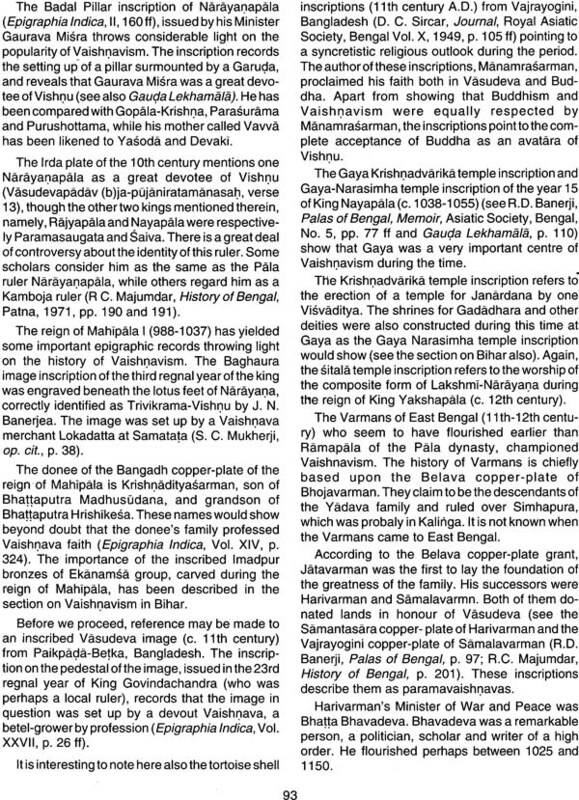 This accounts for what we learn from medieval Indian inscriptions that state the provision made by the kings for the reading and exposition of select portions from the epics, for the education and sublimation of the villagers, young and old, lettered and unlettered, in the sabha and vyakhyanamndapas, spacious pillared halls in the large temples that abounded in the villages. In the noblest spirit of appreciation of the great national epic and its purport, Anandavardhana, the doyen of rhetoricians in India, has in unequivocal exposition given Santi or peace as the dominating flavor in the Mahabharata, which combines in itself instruction and poetry; and as he shows clearly, its concluding note of despair on the hapless destruction of the Vrishnis and the Pandavas, reveals, the anxiety of its saintly author to primarily expound the moral of renunciation as a means to final emancipation or moksha as the highest of human values, purusharthas: mahãbhãrate’ pi sastrarupe kavyachchhayanvayini vrishnipandavavirasavasanavaimanasyadayinim samaptim upanibadhnata mahamunina vairägyajananatätparyam pradhänyena svaprabandhasya darayata mokshalakshanah pursharthas anto rasas cha mukhyatayä vivaksha vishayatvena suchitah, Dhvanyaloka 4.5. 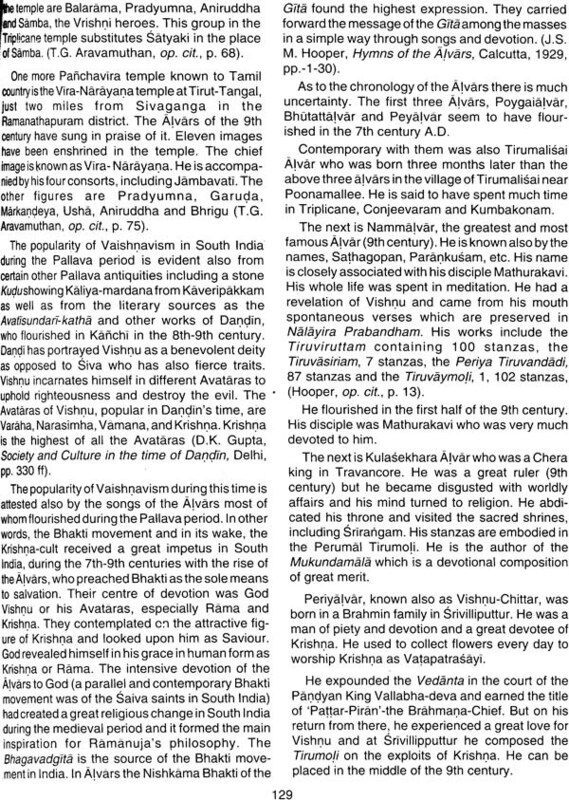 As the greatest expounder of the charm of suggestion, Anandavardhana demonstrates how Vyasa has effectively conveyed all this meaning through the implied sense in the sentence ‘the eternal Lord Vasudeva is herein glorified’. He expatiates further by exhorting the readers to be devoted to Him, the Supreme Lord, to desist from passion for empty material gains, or even attachment to such qualities, however much desirable in themselves, like statesmanship, modesty and velour. He holds that this beautiful inner truth is revealed in his act of appending the Harivatha as the finale of the Mahabharata to sing the glory of Han: satyarh antasyaiva rasasyãñgitvarh maha bha rate mokshasya cha sarvapurusharthebhyah pradhanyam ityetanna svaabdãbhidheyatvenanukramanyam darsitam, dartitam tu vyahgyatvena- ‘bhagavãn vasudevas cha kirtyate’ tra sanatanah’ ‘ityasmin vakye anena hyayam artho vyahgyatvena vivakshito yadatra mahabharate pandavadicharitam yat kirtyate, tat sarvam a vasana virasam avidyâprapancharupath cha, paramärthasatyasvarupas tu bhagavan väsudevo’ tra kirtyate, tasmat tasminneva paramevare bhagavati bhavata bhavitachetaso, msbhuta vibhutishunissaräsuragiqo, guneshu va nayavinayaparakramadishvamishu kevaleshu keshu chit sarvafrnana pratinivishtadhiyah, Dhvanyaloka 4.5. The purusharthas themselves have been most marvellously analysed in the Bhagavata, and here the final beatitude or moksha has been given the highest place to secure which artha and kama strive through dharma. Artha cannot be the means of dharma, since the latter itself is the means for moksha. Still artha is mainly to win dharma, and hence cannot be made the means of kama: dharmasya hyapavargasya nartho’ rthAyopakaipate, närthasya dharmaikantasya kamo Iäbhaya hi smritah, Bhagavata 1.2.9. The unfailing path in the direction of obtaining this beatitude lies in the intense devotion towards the Lord Vasudeva which speedily vouchsafes the spirit of renunciation vairagya, and right perception, jnana, that arises in its train without any effort: vasudeve bhaga va ti bhaktiyogah prayojitaiy, janayatyäAu vairagyamjnãnam cha yadahaitukam, Bhagavata 1.2.7. 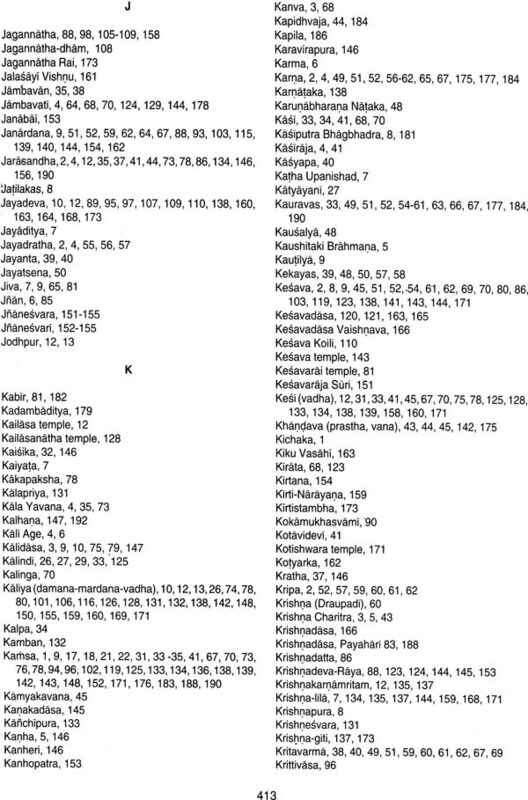 In his Kusumanjali, which bristles with quotations from the Lord’s Song, Bhagavadgita, Udayana recalls the birth of Krishna as the assuming of bodily form by the Lord and shows how though He had no need to be up and doing (name parthãsti kartavyam trishu lokeshu kinchana), He acted only to set the world to follow his example: grihnativaropi kãryavaáAchchhariram antarantarä darayati cha vibhutim itiatrapyagamah pitAmahasya jagato mãtä data pitamahah, tatha, yadi hyahar’n na varteyarh jätu karmanya tandritah, mama vartmanuvartante manushyah partha Sarvasaj, utsideyur ime loka na kuryam ched aham Nyayakusumanjali 5.5 how Isvarapranidhana is ultimately devotion in thought word and deed to Vasudeva as experienced by the greatest in every path like ishta purtatapas and yama niyama dna asana of yoga is recalled by him from Sankhyapravachana and the Bhagavadgita anusishyate cha sankhya pravachane isvaraparanidhanam tam imam jyotishtomadibhir ishtaih prasadadina purtena sitatapasahanadina tapasa ahimsadbhir yamaih asanapranayamadian yogena maharshoyo pi vividhishanti tasmin jnate sarvam idam jnatam bhavatityevarh vinaya srutyekatanas tatparo bhavet yatredam givayte mammana bhava madbhakto madyaji mam namaskruru mamevshyasi yuktaviavam atmanam matparayanah bhotaram sarvabhutanam jnatva mam santim richchhati iti Nyayaksumanjali. 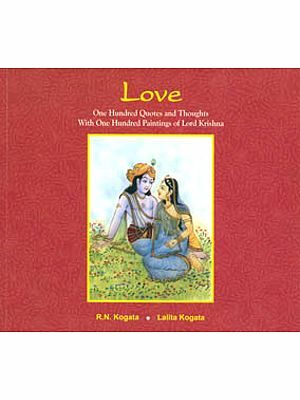 THERE is an enormous volume of literature on the life and teachings of Krishna. He is a composite figure and many legends and ideas have combined to constitute the frame-work of his concept. While the majority of scholars look upon him as a historical person, some consider him to be a myth or a vegetation spirit. The truth seems to be that originally he was a human being as Rama and Buddha, but he was deified as a god, perhaps during his life time, because of the inconceivable qualities he possessed. He is the amalgam of both the divine and the human. In the Mahabharata, the earliest source of his life, he is described both as man and God. From the very beginning of the Krishna concept it is difficult to separate the human aspect of his life from the divine. He is a grand mystery and everyone has tried to understand him in his own way, according to his spiritual light or vision. He is the embodiment of all rasas, and his many-sided activities have attracted the people in different ways. The yogis considered him to be the absolute truth, the Gopis the highest object of love, the warriors as an ideal hero and Karhsa as an object of fear and Siáupala as an object of hate. 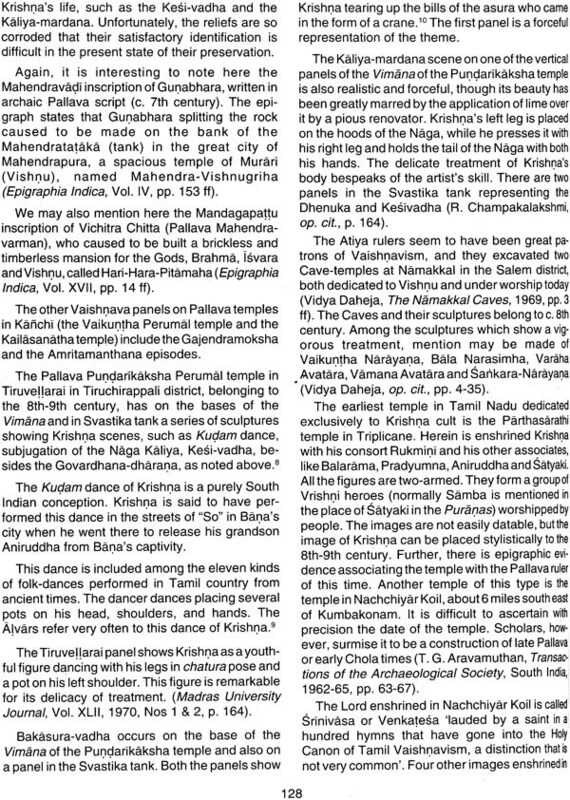 This idea as expressed in the Bhagavata Purana has made the Krishna worship broad-based. Whether one thinks of him as an object of love or hate, one attains him. 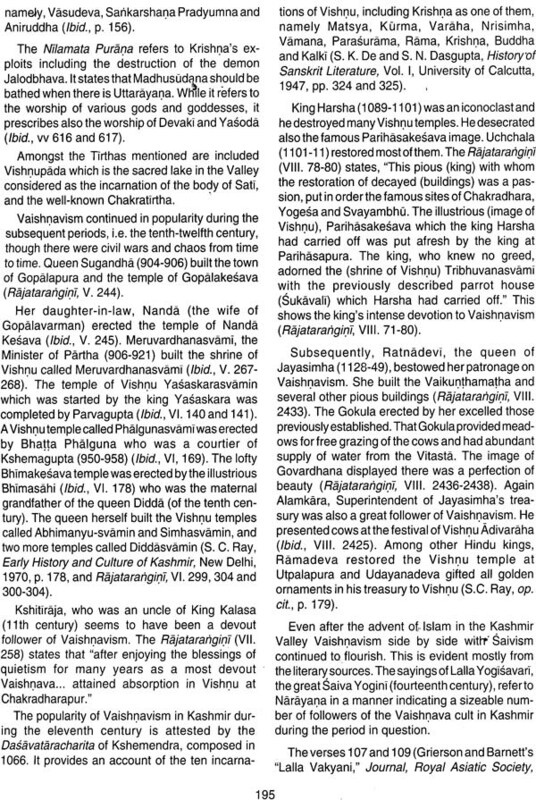 Addressing Yudhishthira, Narada said, ‘By fixing their minds on Isávara, through love, through hate, through fear, through friendship as by devotion and thereby avoiding their sins, many have found access to Him, the Gopis through love, Karhsa through fear, Siáupala and other rulers of men through hate, the Vrishnis through relationship, you (i.e. Yudhishthira), 0 great one, by friendship, we by devotion” (Bhãgavata Purãna VII. 1, 29 and 30). 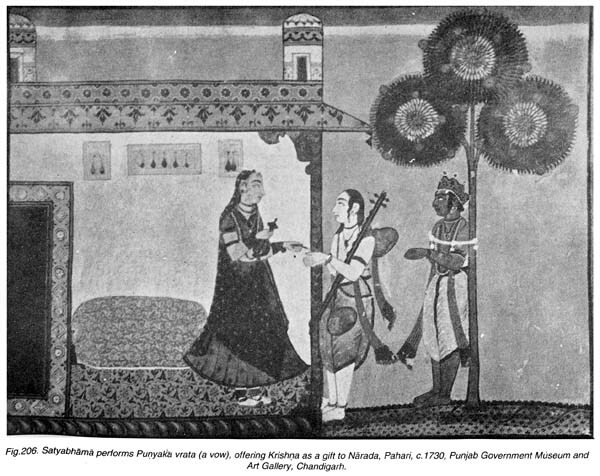 As the Krishna cult crystallized in the medieval period paramaprema (i.e. the desire less and attribute less bhakti or love) was considered the highest as the Gita advocated the desire less action. 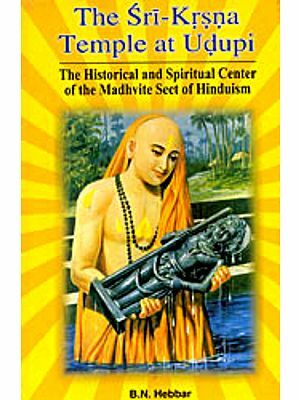 Sri Chaitanya was possessed of this attitude. This feeling has been best expressed in one of his Sikshashtakas: “I crave not for money, nor for men, not for a beautiful woman nor for poetic genius, 0 Lord of the world; in every birth of mine may ahaituki bhakti spontaneous devotion, grow in me towards Thee. 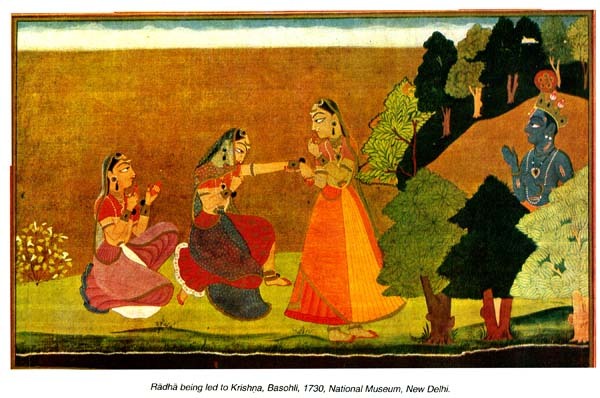 The life of Krishna from childhood to his last days has been a source of perennial inspiration to the poets and the artists, as he represents the perfection of human character, and Endeavour. He is the embodiment of the intellectual and spiritual glory. 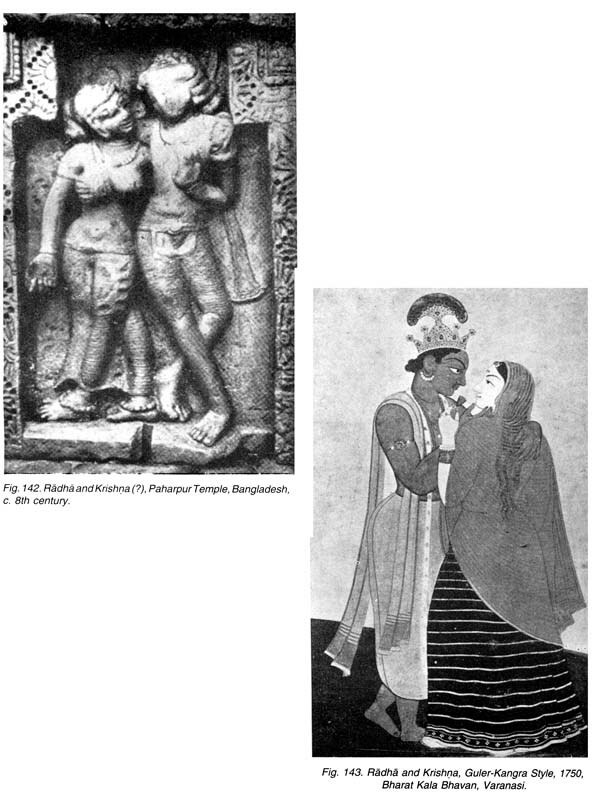 Krishnaism permeates the entire Indian culture and thought. No other single individual or idea has so much influenced the course of India’s religion, philosophy, art and literature as the life and personality of Krishna. 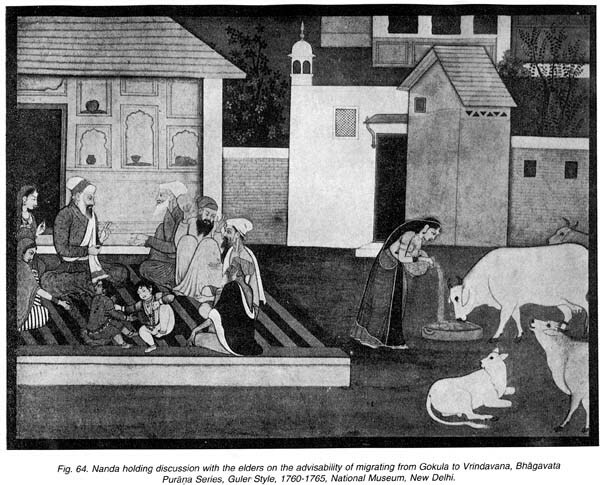 As a child, he was a wonderful child, an object of love to all, as a youth, he was physically most perfect and beautiful (nobody, not even Balarama or Bhima or Kichaka or Salya was as strong as Krishna was), his physical charm was beyond a parallel and the only desire Bhishma had at his death-bed was to see the most beautiful face of Krishna. As an intellectual he was the very embodiment of Vedic scholarship and his teachings in the Gita embody the immortal message of desire less action, knowledge and single- minded devotion (Sankara describes the Gita as the quintessence of Vedic knowledge). As a profound Yogi he is called Yogevara (which aspect is revealed on many occasions). As a fighter, he was without a rival, as a statesman, most shrewd, as a social thinker, very liberal, as a teacher, the most eloquent, as a friend, never failing, and as a householder, the most ideal. The cordial reception Sudama (a poor Brahmana and classmate of Krishna) received speaks of Krishna’s sincerest love of his friends. As an ally of the Panciavas, he stood by them all through in the days of their adversity. It is through his help and wise counsel they could win the terrible Mahäbharata war. They have acknowledged his help and greatness again and again. At the time of the Asvavamedha sacrifice Yudhishthira, out of gratitude, went to the extent of saying that Krishna, rather than he (Yudhishthira) should be initiated to the sacrifice. 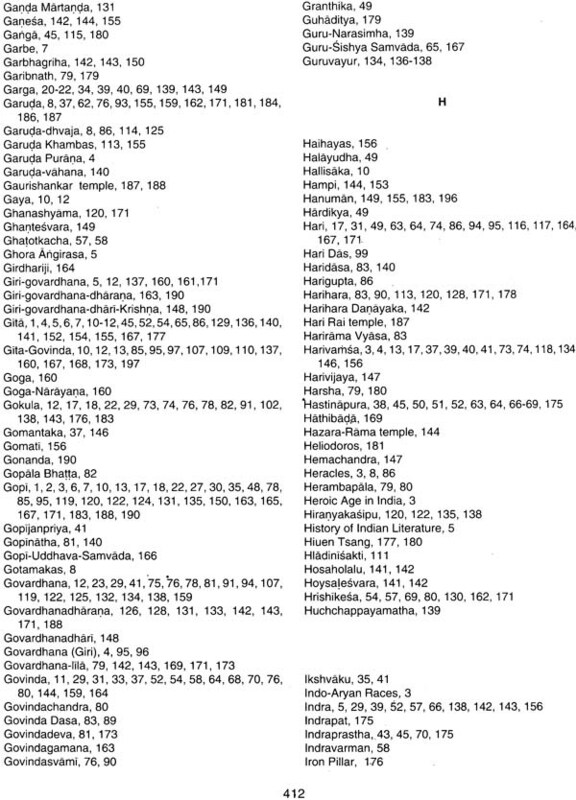 The terrific nature of the Bharata battle is indicated in the following verses. ‘The battle-river with Bhishma and Drona as its bank, and Jayadratha as the water and the king of Gandhara (Sakuni) as the blue water-lily and Salya as the shark, with Kripa as the current and Karna as the breakers, with Aávatthama and Vikarna as the terrible makaras (crocodiles) and Duryodhana as the whirlpool in it was indeed crossed over by the Pandavas with Keáava as the ferryman” (Svami Pranavananda, SrimadbhagavadgitA, 1967, p.vii). As a householder Krishna followed the established code of life most scrupulously. As Paramatman he had no duties to perform, but he adhered to social rules and duties to set an example to others. Though his life was beset with many difficulties, he was free from fear and taught others to be fearless. At the commencement of the Bharata battle he exhorted Arjuna to shed all attachment and fear and fight for a right cause. He never gave way to grief and lamentations. He was an upholder of social justice. He fought against Naraka not only to get back Aditi’s ear-rings but also to release about 16,000 ladies who were wrongfully kept in captivity by the demon. He did not stop there, and considering the sad plight of these ladies, he married them and conferred a social status on them. Krishna’s strength and valour, knowledge and wisdom placed him above others. In his presence, everybody paled into insignificance. Everybody was eagerto hear what he said. He was the master of all situations; whether in war, or statecraft or peace he was supreme. Even those who did not belong to his school of thought (for example, Duryodhana, Jarasandha, Dantavaktra, iáupaIa and Salva) feared him and respected him, though openly reviling him at times. All the great men of his times, Vyasa, Bhishma, Vidura, Yudhishthira and Arjuna bowed their heads in reverence to him. As he was the greatest of all, he received the agrapuujA at the Rajasuya sacrifice. Indian tradition regards him as the greatest of the Yogis. Even in Rasalila, he is called a yogi. Because he was a yogi having passions perfectly under his control he could revive Parikshit into life when he was born dead. His Vrindavana lila with the gopis may be treated either as his childhood pranks or symbolic of the yearning of the individual souls for union with the supreme Lord as he was looked upon. 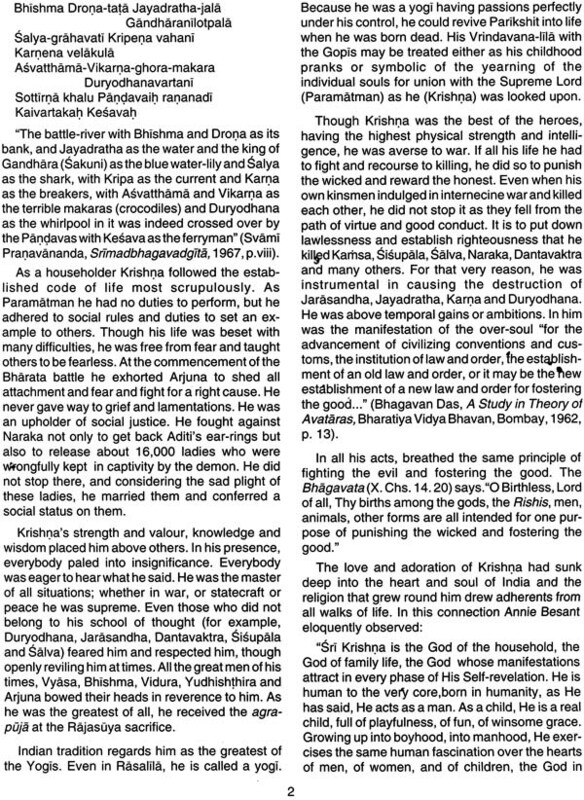 Though Krishna was the best of the heroes having the highest physical strength and intelligence he was averse to war. If all his life he had to fight and recourse to killing he did so to punish the wicked and reward the honest. Even when his own kinsmen indulged in intermecine war and killed each other he did not stop it as they fell from the path of virtue and good conduct. It is to put down lawlessness and establish righteousness that he killed Kamsa, Sisupala, Salva, Naraka, Dantavaktra and may others. 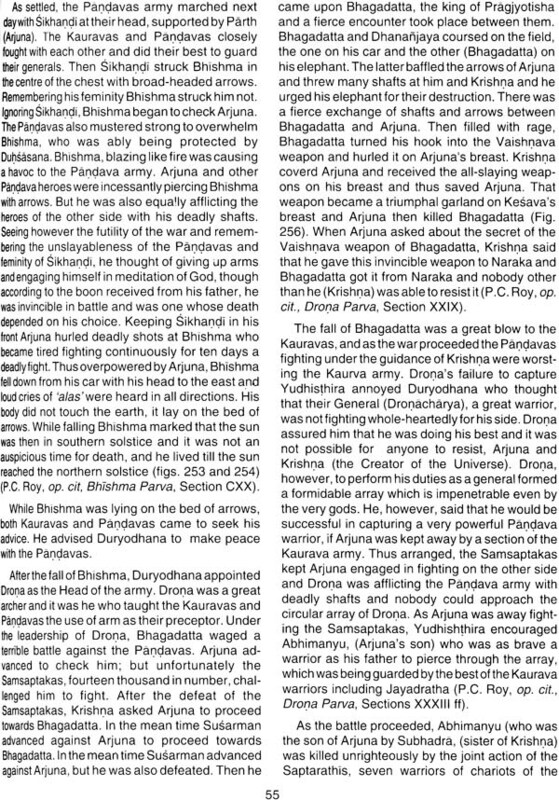 For that very reason he was instrumental in causing the destruction of Jarasandha, Jayadratha karma and Duryodhana. He was above temporal gains or ambitions. In him was the manifestation of the over soul for the advancement of civilizing conventions and customs the institution of law and order the establishment of an old law and order or it may be the new establishment of a new law and order for fostering the good. 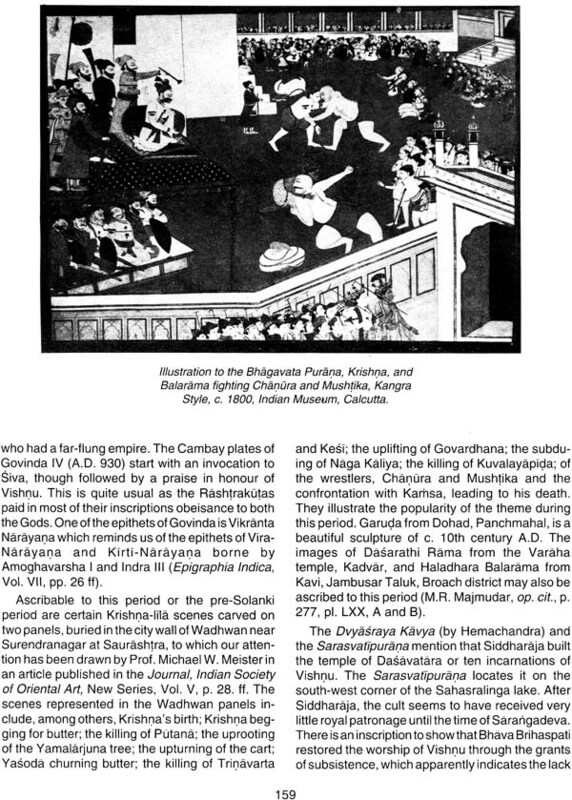 A study in theory of Avataras, Bharatiya Vidhya Bhawan Bombay 1962. In all his acts breathed the same principle of fighting the evil and fostering the good. The Bhagavata says. O Birthless lord of all thy births among the gods the Rishis men animals, other forms are all intended for one purpose of punishing the wicked and fostering the good. The love and adoration of Krishna had sunk deep into the heart and soul of India and the religion that grew round him drew adherents from all walks of life. In this connection Annie Besant eloquently observed. Sri Krishna is the God of the household the God of family life the God whose manifestations attract in every phase of His self revelation. He is human to the very core born in humanity as he has said. He acts as a man. As a child he is a real child full of playfulness of fun of winsome grace. Growing up into boyhood into manhood he exercises the same human fascinations over the hearts of men of women and of children the god in whose presence there is always joy the god in whose presence there is continual laughter and music. When we think of Sri Krishna we seem to hear the ripple of the river the rustling of the leaves in the forest the lowing of the kine in the pasture the laughter of happy children playing round their parents knees. He is so fundamentally the god who is human in everything who bends in human sympathy over the cradle of the babe who sympathises with the play of the youth who is the friend of the lover the blesser of the bride groom and the bride who smiles on the young mother when her first born lies in her arms everywhere the god of love and of human happiness what wonder that his winsome grace ahs fascinated the hearts of men. On the unique personality of Krishna Sister Nivedita says. 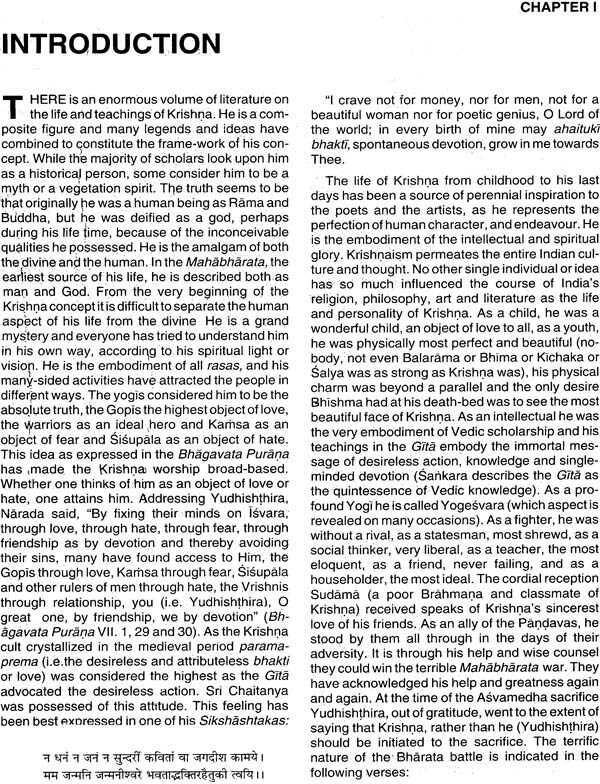 The grand personality that towers over Kurukshetra and enunciates the body of doctrine which all India know to be the core of dharma combines in himself the divinity of the Indian Siva the virility of the Greek Heracles the simplicity of the Judean Christ the tenderness of Buddha the calm austerity and learning of any teacher of the Upanishads.